It’s designed for Poodle people like us and for anyone considering life with a Standard Poodle. Poodles have shared my life for 29 years. Today we live with our spoiled dogs in a world of rivers and Cascade Mountains in Portland, Oregon. We’re committed to this wonderful breed that brings its human families such joy and to a future for Standard Poodles with good minds, health, and structure, longevity, beautiful breed type and those poodley extras that make a Poodle uniquely a Poodle. Take a look around the site for more about us and our Poodle pack (My life in Poodles began when a landlord said no! 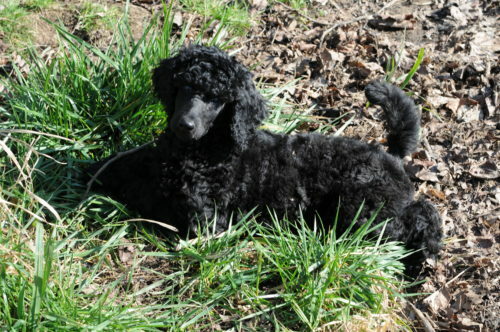 ), our news, my thoughts on Standard Poodles and finding a good puppy, links to other poodledom websites, some Poodle “likes” and more………..
We aren’t expecting puppies this year, but check our “Puppies” page for thoughts on finding that special addition to your family. error: Content is copyright, do not copy ! !